Inaugural Westshore District Worker and Resident Survey Results Are Here! Westshore Alliance and HCP Associates recently conducted the first-ever Westshore District-wide Worker and Resident Survey to gain stronger insights on the demographics, perceptions and activities of those who work and live in Westshore. Participants chose Westshore's location and the benefits it provides through access to the airport, highways, shopping, entertainment, residential offerings, major employers, etc. as the District's major assets. Biggest demands are for improved ingress/egress and in-district traffic circulation. Additional requests are for development that takes greenspace into consideration, grocer access, improved walkability and connected bike paths/trails. Data is being used to analyze stakeholder priorities, identify issues to be addressed, and incorporate results into the blueprint for Westshore's continued economic viability. Survey results are on the Alliance website. Questions? Email Heather Mackin or call 813-289-5488. We are pleased to welcome Michael Maurino as Westshore Alliance Director of Transportation and Planning. Maurino brings more than a decade of experience in government relations and advocating for policies and projects, including transportation improvement strategies. Maurino will focus on improving mobility options within and to the Westshore District. This includes serving as project manager for transportation studies, programs and capital improvement projects for Westshore, as well as advocating for transportation improvements that will positively impact the District. Read the announcement. 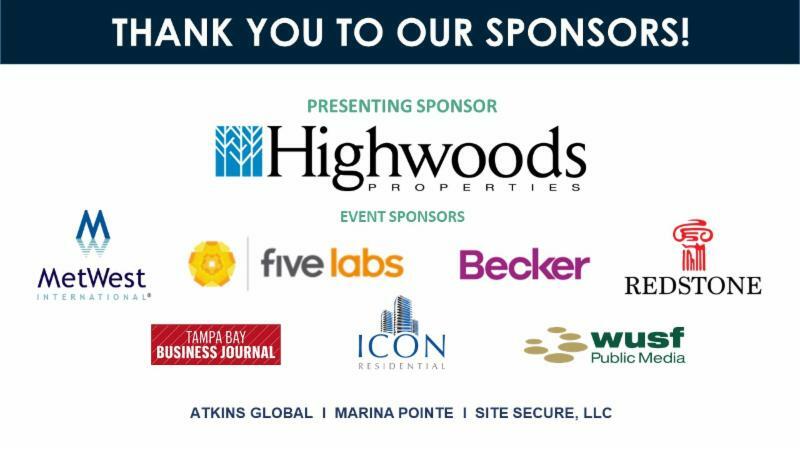 The 16th Annual Westshore Development Forum presented by Highwoods Properties was held last month with nearly 200 attendees. Highlights included results from the inaugural Westshore District-wide Worker and Resident Survey, as well as the latest Westshore commercial development, trends and transportation initiatives. Thank you to our event sponsors, presenters and everyone who joined us. The photo gallery can be viewed here, and presentations are available on the website. Want more hurricane preparedness information? Read our latest Safety & Security E-newsletter here. REGISTER by June 8 at noon. July 4: The Westshore Alliance office will be closed in observance of Independence Day. Metro Diner celebrated its grand opening on May 29 at 4011 W. Kennedy Blvd. The restaurant serves breakfast, lunch and dinner, with seating for 124. More than 100 jobs will be created at the new location. GrillSmith, the Tampa-based American restaurant brand known for grill-forward, refined-casual comfort cuisine, is now open at 612 N. Dale Mabry Hwy. Poké Fish, a fast-casual Hawaiian concept, is scheduled to open at 4424 W. Kennedy Blvd. on June 8. The rebuild of the I-275/SR 60 Interchange, also known as the Westshore Area Interchange, which is a key component of Tampa Bay Next, has been the Westshore Alliance's top transportation priority for many years. The project faces a critical vote by the Hillsborough Metropolitan Planning Organization (MPO) on Tuesday, June 12. The public hearing will be broadcast live on HTV, and there are many ways to participate. View details HERE. Pedestrians can enjoy new sidewalks in Westshore, which were recently installed on the north side of Laurel St. from Frontage Road to O'Brien St. and on the north side of Columbus Dr. from Himes Ave. to Dale Mabry Hwy. There have been 10 miles of new sidewalks installed in Westshore since 2008. The Courtney Campbell Trail recently received an award from the Tampa Bay Regional Planning Council. The award is given to projects that exemplify regionalism, and it recognizes outstanding achievements and contributions that benefit the regional community. The award was presented to the following recipients: Florida Department of Transportation District 7, Hillsborough County, Pinellas County, City of Tampa, City of Clearwater, Courtney Campbell Scenic Highway Corridor Advisory Committee, Florida Scenic Highway Program, AECOM and the Westshore Alliance. Westshore Alliance is proud to be part of a great public/private partnership that brought the Courtney Campbell Trail to the Tampa Bay region!